Do you have a little fur baby who loves to run around and get into mischief? Maybe one who you lose sight of every so often and have to go on a hunt, calling out their names, looking for where they went and what they've got into? Well, you could go several routes to try to keep track of your pet. There is the bell on the collar trick as well as really fine-tuned GPS tracking, but putting all your trust into hearing and satellites might not cut it. You need something you can see! Give your little monster a bit of extra visible mass with this Shark Fin Dog Costume piece. This gray velour shark fin is attached to a simple shirt that fastens around your pet's belly. It'll be like your dog is waving for your attention and may inspire a fun little diddy in your head as it comes bounding for your attention. It's generally inadvisable and probably illegal to have a shark as a household pet. But, there is nothing wrong with giving your existing pet a little vicarious oceanic thrill. 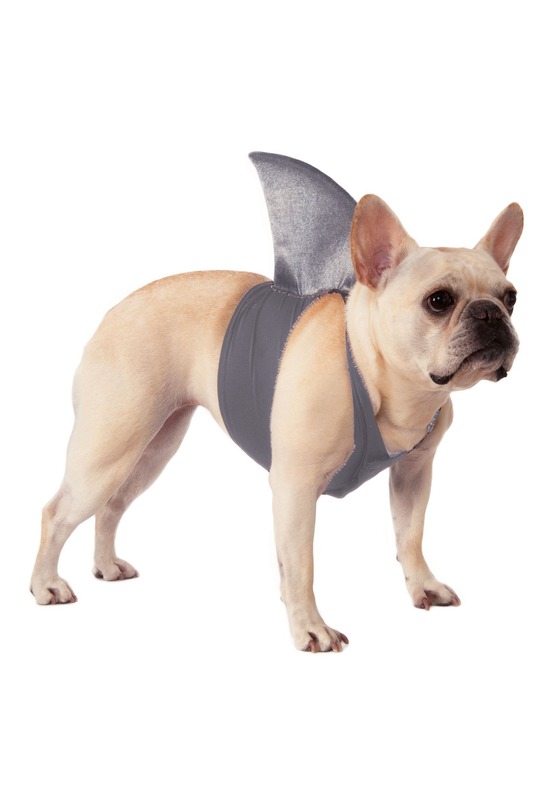 Put a fuzzy spin on that shark movie with this Shark Fin Dog Costume. Just be sure you have some treats on hand!